We were starting to get worried. 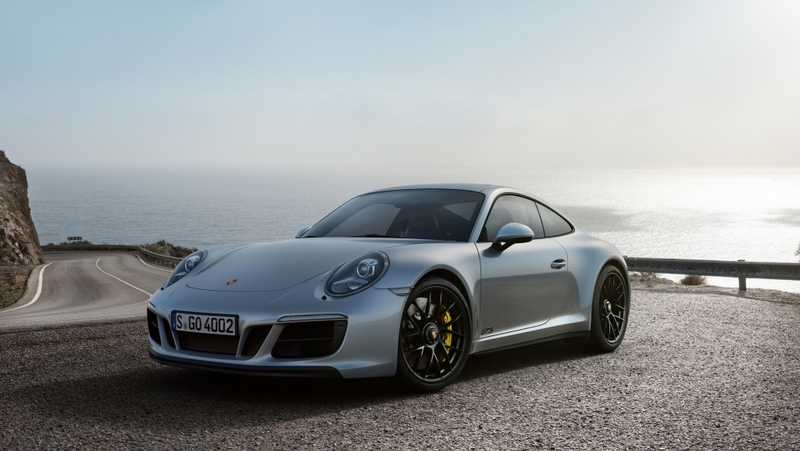 There hadn’t been a new version of the Porsche 911 added to the current range for at least six months. Thankfully, Stuttgart has bolstered its burgeoning line-up of rear-engined sports cars with the facelifted Porsche 991.2 Carrera GTS. Yes, like its first generation predecessor, the name is a bit of a mouthful (especially if you opt for the four-wheel drive Cabriolet version) but, while this may seem like just another 911 variant, the updated GTS brings with it some headline-making figures. Using the 3.0-litre twin turbocharged flat six engine introduced into the 911 Carrera line-up at the end of 2015, a new turbocharger design has allowed Porsche to squeeze 450hp from the 991 Carrera GTS’s powerplant. That’s a 30hp jump over the current 911 Carrera S. What’s more, peak torque has been increased to 550Nm, allowing the 2017 Porsche 911 Carrera 4 GTS to sprint from 0-62mph in just 3.6 seconds when equipped with the dual-clutch PDK gearbox. As before, the GTS treatment – which includes a smattering of bespoke black trim, a more aggressive front bumper design and silk black centre-lock rims as standard – is available across the Porsche 911 Carrera range. If you want a Cabriolet GTS with rear-wheel drive, you can have it. If you’d rather have a four-wheel drive Coupé, you can have it. Fancy a 911 GTS with a Targa top (now finished in satin black)? Yep, you guessed it. YOU CAN HAVE IT. Unlike the standard 911 Carrera, the GTS version uses the wider body shell from the Carrera 4, even in rear-wheel drive form, providing an alluringly curvy silhouette. The interior has also received a slight makeover. 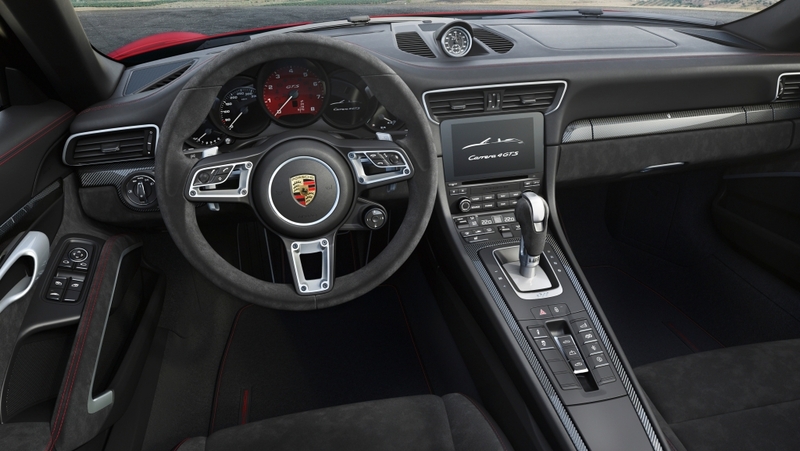 With swathes of Alcantara on the hard-backed sports seats, steering wheel and gear lever, Porsche hasn’t exactly hidden the new 911 GTS’s sporting credentials. The famous five-dial dashboard also gets a new brushed, black aluminium finish. The 2017 Porsche 911 Carrera GTS isn’t just about the aesthetic tweaks and increase in power though. 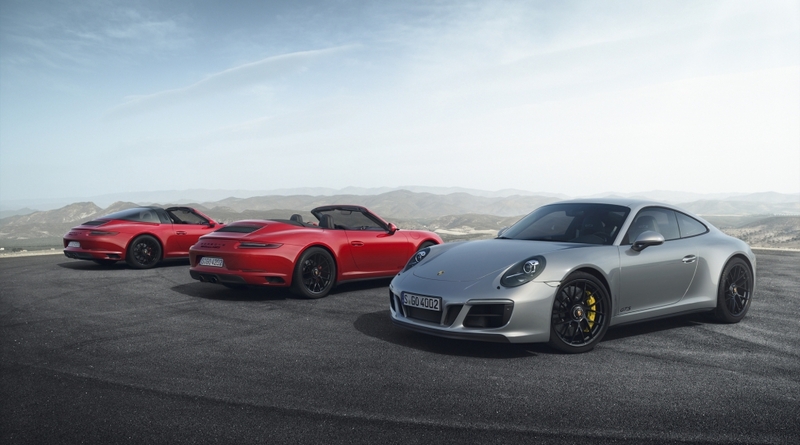 Each variant comes with Porsche’s adaptive PASM suspension system, while all GTS Coupés now feature sport suspension that lowers the whole car by a further 10mm. Porsche’s Sports Chrono package is also included as standard and the Track Precision app (allowing you to record and analyse your on-track exploits via your smartphone) has been updated. 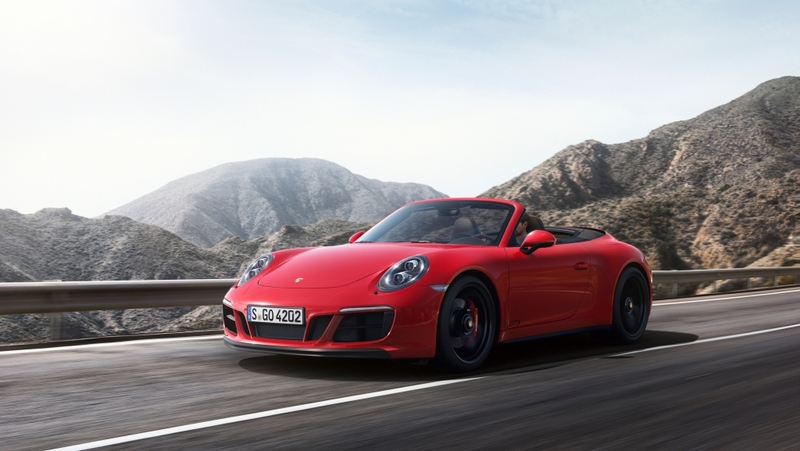 Available to order now, the new Porsche 911 Carrera GTS starts at £94,316, rising to £108,144 for the Targa 4 and Carrera 4 Cabriolet versions, with the first UK deliveries expected in March.